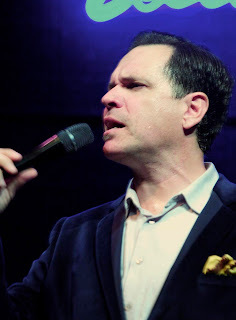 In March, Jamie Cullum interviewed Kurt Elling for BBC Radio. Cullum began by introducing Kurt as "someone who wanted to make me sing jazz in the first place. I can't say it any simpler than that. His voice first got hold of me when I heard him sing twenty seconds of a cappella on a documentary about Ella Fitzgerald when I was seventeen years old. What then followed? Many miles of traveling to see him play. On more than one occasion, I'ved based entire holidays around hearing him sing." I've done that a few times myself. "I did, actually. I remember catching Mark Murphy at a place called the Artists' Quarter in Minneapolis." (The AQ is now in St. Paul, but it was in Minneapolis originally, on 26th across the street from the Black Forest.) "And I was also in college. Somebody said, 'Let's go hear this guy' [and I said] 'Okay.' And I remember his version of 'Never Let Me Go,' and of course he does that great ending where he repeats the first line of the bridge as the closer. That knocked me out. That really turned my head around and pointed me in another direction." KE fans, this is a very enjoyable interview, including a live in-studio performance by Kurt, Laurence Hobgood, and Cullum. It will be available for a limited time, so catch it while you can. If you've read about KE on this blog before, you may recall an earlier post (from, as it happens, an earlier Jamie Cullum interview for BBC Radio) in which Kurt explains vocalese. He does it again this time. Let's see what he says about it this time. "Vocalese is when you hear an instrumental cut, and you listen to the solo that was originally improvised on a recording, and then you do a transcription, meaning you write down the notes or trick-and-scratch or however you need to do it so you can learn what those lines are, and then you write a lyric to fit the contours of that solo." [Here Cullum laughs and says, "When you explain it, it sounds even more difficult." KE continues:] "I want to be clear because it's such an obscure little art form, and there are so few practitioners, but it's really fun and lively, and it's a huge musical and intellectual challenge because you have to know language well enough to have the rhymes fall in the right places, and you have to know music well enough to feel and understand where the rhymes should fall, given the musical lines." [Here Kurt gives an example of an Eddie Jefferson vocalese to a Charlie Parker tune -- as he did in March 2011, but this is a different example. And concludes:] "It sounds like it's organically happening, if you do it right, but really it's all coming from instrumental lines."